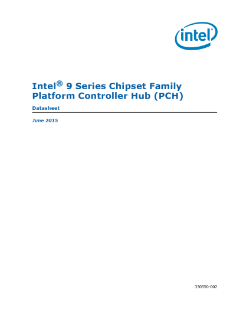 This document is intended for original equipment manufacturers and BIOS vendors creating products based on the Intel® 9 Series Chipset Platform Controller Hub (PCH) (See section 1.3 for SKU definitions and supported features). PCI Express* (PCIe) Base Specification, Revision 2.0 support for up to eight ports with transfers up to 5 GT/s. Advanced Configuration and Power Interface (ACPI) Power ...Management Logic Support, Revision 4.0a. Enhanced direct memory access (DMA) controller, interrupt controller, and timer functions. Integrated Serial ATA (SATA) host controllers with independent DMA operation on up to six ports. Extensible Host Controller Interface (xHCI) USB controller provides support for up to 14 USB ports, of which six can be configured as SuperSpeed USB 3.0 ports. Two legacy Enhanced Host Controller Interface (EHCI) USB controllers each provide a USB debug port. Flexible I/O, a new architecture to allow some high-speed I/O signals to be configured as PCIe, SATA, or USB 3.0. Integrated 10/100/1000 gigabit Ethernet media access control (MAC) with System Defense Feature.